Homer: It’s nothing big; it’s just a lot of little things. 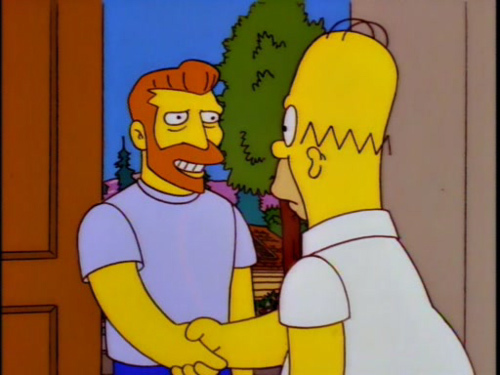 Scorpio: Homer, you can’t argue with the little things. It’s the little things that make up life. In the biography written by Walter Isacsson, Steve Jobs recalls watching his father paint the posts for the picket fence in the yard of their Cupertino home in the 60’s. A young Jobs asked his father why he was painting the back of the posts as well as the front, even though nobody could see the back of the posts. His father replied: “because I know they’re there”. This is attention to detail. The little details count, and more than you probably think. Whether spelling or grammar; visual consistency or alignment; order or neatness: paying attention to the finer presentation details makes an important difference to your message. It doesn’t matter if it’s a visual interface within a product, an instruction manual, a marketing message, a powerpoint slide or a simple email: the principle is the same. It’s not just about having a powerpoint slide with consistent punctuation… and it’s not about perfectly painted fence posts. It’s an attitude that you carry with you everywhere; that’s part of everything you do. If you have three paragraphs on a slide or page, and the first three have a fullstop and the last one doesn’t… fix it. Don’t use 5 different font sizes on the same slide. If you’re writing code, take care to follow the coding guidelines. Document. Clean up after yourself. Keep it tidy. Grammar, spelling, etc matter… whether in an email or in interface copy. Take care. Use a spell-checker. If you’re not a native speaker of the language you’re writing in, have someone proof-read it for you if it is something that will be seen by a lot of people. This entry was posted in Life at work, Product Design and tagged attention to detail. Bookmark the permalink.